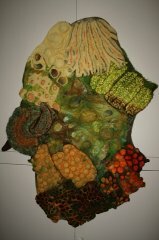 I am an experienced felt maker to City and Guilds Diploma level. I describe myself as a mixed media felt making artist because I like to incorporate knitting, crochet, machine embroidery, print and paint etc into my felt making where appropriate. (I have a City and Guilds Diploma in Machine Embroidery as well as in felt making). I colour fibres and fabrics by dyeing, printing, painting, etc, for use within felt making. I card my own funky art fibres and spin yarns to use in my work as well. I make a wide variety of items, including wall hangings, vessels , clothing, accessories, etc.